Sequins and Sea Breezes: Who Doesn't Love A Good Sale? Happy Humpday dolls! Thank goodness the rest of the week is all downhill from here. I am exhausted and ready to get some sleep in this weekend! I can tell the days are already getting shorter and it's making it tough getting up in the morning with it still being pitch black out. Hopefully that also means cooler weather is right around the corner. Speaking of cooler weather, summer is quickly coming to an end which means the summer flash sales are out in full force! I have a love/hate relationship with these flash sales, especially when I just got back from vacation. But truthfully, who can say no to a good sale? Especially when I was so good during the Nordstrom Anniversary sale and didn't end up buying a thing (crazy, right?) so why not splurge a little now? These flats are perfect for the summer to fall transition and will even be perfect in the spring! Obsessing over this slouchy hobo bag and this structured satchel. I love how cute this ring is! It'd be perfect for stacking or just wearing every day. I've been on the hunt for a new makeup bag and this one is perfect! I know maxi dress season is almost over but I am absolutely in love with this one. I can imagine wearing it around some place gorgeous like Greece! This fringe crossbody would definitely be on repeat this fall and such a great price! Also, this mini bucket bag is perfection! I already have a bag in that color and I love it so much I want the bucket bag in the same color! The spike detail on the back of these espadrilles is so fun! I almost bought this ring during the Nordstrom sale but now I'm glad I didn't! It's cheaper now than it was through that sale! Ashley had this iPhone case when we met up for brunch in Charleston and I fell in love! So I was super excited when I saw some of the colors are currently on sale. I also really love the color of this clutch. It seems extremely versatile for any season! Seriously lusting after ALL of these things! Any one want to help me narrow down my wish list to something more manageable?!? There are so many great sales right now! which is great because I can stock up for fall and grab some late summer deals too! Just got my Kate Spade Sunglasses in the mail and I am obsessed!! Plus the case is hot pink and orange.......so that is half the fun ;-) Awesome round up, loving all your picks! Definitely get the iPhone wallet! It goes with me everywhere and makes switching purses so easy. Love those espadrilles! Nothing from the Nordstrom sale?? I wish I made it out that good! Love everything you picked! I'm so impressed that you didn't buy a single thing from the Anniversary Sale! I wish I had that willpower! I'm trying to stay away from the Tory Burch sale... but a couple of things are definitely calling my name! Such a tempting post oh my goodness!!!! Tempting sales are like dangerous!!! You want so much! Also love all these accessories! Noooooooooo, I can't spend anymore money!!!!! You have such great taste. Love the color of the clutch! And I love that MK watch! ohh i love those espadrilles!! so many cute things! I only bought one thing during the Nordstrom sale... and it was for baby boy, of course!! Ha! I love allll your finds! Can you just be my personal shopper? Ha ha! Oh I love all these goodies. I love a good sale. I bought so much during the Nordie's anniversary sale, that I'm trying to be so good and not shop. But Girl, you are tempting me so badly. Oooh, so many cute things! I Love the opening picture - so true!!! I love those flats - perfect for casual and cute!! maxi season is never over ;) lol. and yes i always love a good sale haha but i'm trying to be good! those flats though.. so cute! I have been sooo tempted by the TB sale! hard to resist ahhaha! Love those striped flats! Yes, please! Love all of these picks! SO many goodies here! I'm with you, I have such a love/hate relationship with these end-of-summer sales. I basically just want to shop all the time. That picture is so true! 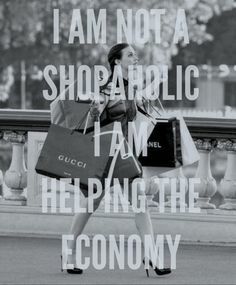 I justify my shopping with that logic all the time! Great choices! I especially love that Rebecca Minkoff Studded Chain Ring! I have been DYING for a Gigi clutch. Definitely getting one for my birthday! Also love that TB phone case! I love all of your picks!!! I don't have a clutch, would you believe it? I have been seeing the gigi ones all over the place and I clearly need to get one in a fun color! I'm swooning over all the clutches/wallets! I want pretty much everything you picked! That blue clutch is adorable! I almost didn't want to click this post because I knew I would want everything you posted and I'm trying not to spend, haha, but looooving that phone case! I love sales, this post has so much temptation. I'm eyeing that watch! Oh man I seriously want it all!